One of the practices we encourage search and rescue personnel to adopt is to use electrical kit that all uses the same size of battery – AA. By doing this you only need to carry a few spare batteries. 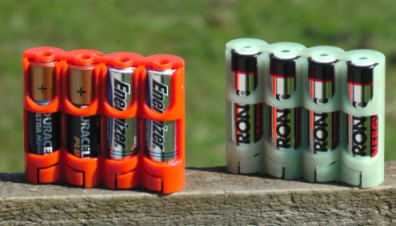 I used to use two small plastic bags for the rechargeable AA batteries I carry, one for fully charged and the other for spent batteries. Additionally, packed in my waterproof box containing my emergency first-aid kit, was a spare set of Lithium AA disposable batteries, still in their original packaging – my failsafe. If it was my head torch then fumbling around using the low light left in the torch searching for my spare batteries or worse still, in no light determining which bag contained the fully charged batteries and which the discharged. My rucksack gets some pretty heavy use and as a consequence my kit inside is knocked about, and frequently the batteries either got dented on the outside or would end up with their terminals touching other batteries and thereby self-discharging. So we purchased these Powerpax Storacell battery caddies, made out of tough polypropylene, and have trialled them on lots of trips, in addition, we have used them on our MR training and call-outs. Firstly they hold batteries securely in place with a unique locking feature, and secondly, they protect the entire battery plus the terminals of the batteries at both ends. These features in themselves would be enough to prompt me to recommend them. I also adopted the simple technique of placing all the charged batteries with the anode at the top and spent batteries the other way up so you could easily identify which were which. But the really good thing about the glow in the dark version was something frankly I thought was marketing speak, it doesn’t just glow it SHINES. Whatever technology is used to give them their luminosity, it is the best I have ever come across.